Fetal heart sounds were reportedly first detected by Marsac in the 1600’s. 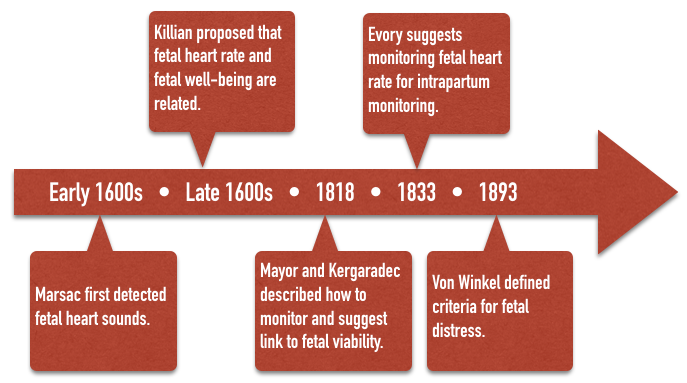 The idea that fetal heart rate could be used to determine fetal well being was first proposed by Killian in the 1600’s. This idea went unnoticed until 1818 when Mayor and Kergaradec described the method of auscultating fetal heart sounds by placing the ear next to the maternal abdomen. Kergaradec further suggested that fetal heart sounds could be used to determine fetal viability and life. By 1833, Evory Kennedy, an English physician, published guidelines for fetal distress and recommended auscultation of the fetal heart rate as a tool of intrapartum monitoring. In 1893, Von Winkel established criteria for fetal distress that remained unchanged until the advent of electronic fetal monitoring (tachycardia – FHR>160, bradycardia – FHR < 100, irregular heart rate, passage of meconium, and gross alteration of fetal movement). By the turn of the 20th century, various authors had described fever as a cause of fetal tachycardia, head compression and cord compression as a cause of bradycardia, and hyperstimulated uterine activity associated with a characteristic fetal heart rate response and asphyxia. The fetal stethoscope, or fetoscope was first described by David Hillis in 1917 at the Chicago Lying-In Hospital. Amid much controversy, in 1922, Joseph DeLee, Hillis’s superior at the same institution, described the device again, taking priority for its creation. The device eventually became known as the DeLee-Hillis fetoscope and was at the forefront of intrapartum fetal monitoring for the next half-century. Using various criteria mostly consistent with Von Winckel’s 1893 description of fetal distress, intermittent auscultation (IA) of the fetal heart rate during labor became widely recommended. DeLee himself recommended a program of auscultation every 30 minutes during the first stage of labor, and every three or five minutes, or even continuously during the second stage of labor, when any of described signs of fetal distress were taken as an indication for forceps delivery. 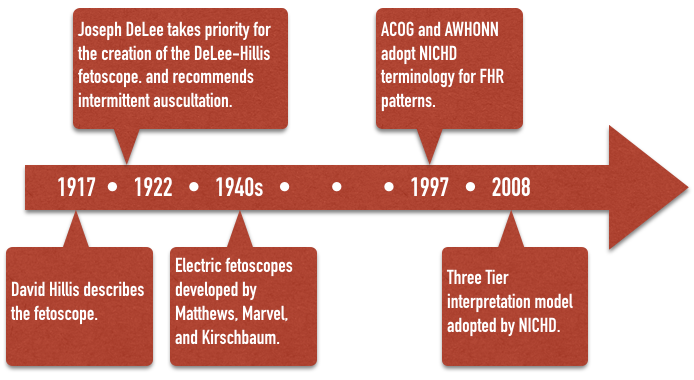 Electric, amplified fetoscopes of Matthews, Marvel, and Kirschbaum made the task of fetal monitoring easier by the 1940s when IA became the emerging standard of care. It remained so until well into the 1970s, and is used in some form even today. However, in 1968, Benson et al. published results of a review of 24,863 labors in which IA was used throughout the 1950s. Fetuses were monitored every 15 minutes during the first stage of labor, and every 5 minutes during the second stage of labor. Their results concluded that IA was not a “reliable … indicator of fetal distress” except in the extreme situation of terminal bradycardia. This damning report emerged at a time when true electronic fetal monitoring (EFM) was being developed and experts were quick to dismiss IA in favor of the hoped-for promise of EFM. In 1906 Cremer described the use of the fetal electrocardiogram using abdominal and intravaginal electrical leads. That led other investigators to attempt to determine fetal status using electrocardiographic patterns only to conclude that fetal distress did not yield any consistent electrocardiographic patterns. Electronic fetal phonocardiography had been described originally by Henly in 1931. These devices simply used a microphone to magnify the auscultated FHR. 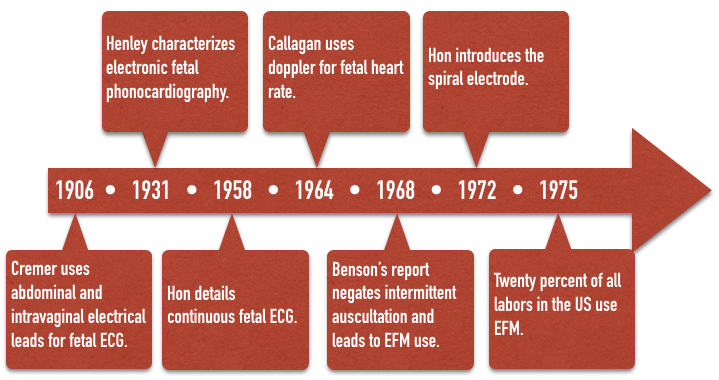 In 1958, Hon, the pioneer of modern EFM, first described a system for capturing continuously the fetal ECG. In 1964, Callagan described a commercially viable system for capturing the FHR with Doppler technology. In the 1960s, EFM systems were made commercially available by Hon in the United States (1968); by Hammacher, a pioneer in the electronic systems to reduced noise-to-signal ratios, in Germany; and in Uruguay by Caldeyro-Barcia, father of among other things, Montevideo units and long-term and short-term variability. Hon had coined the terms early, late, and variable decelerations. The spiral electrode or fetal scalp electrode as used today was introduced by Hon in 1972. More complex electronic methods of differentiating between genuine fetal signal and artifact were introduced over time to work in tandem with Doppler technology, giving rise to modern electronic autocorrelation. By 1975, just over twenty percent of labors were monitored with EFM, a number that now stands at well over eighty percent. Numerous other methods have been or are being developed as tools for intrapartum monitoring, including fetal blood sampling; scalp or acoustic stimulation; continuous fetal pH, PO2, SpO2, and PCO2; ST segment analysis (STAN); and near-infrared spectroscopy. Until recently, as new technologies have emerged, they have been adopted into clinical practice before large studies were carried out regarding their efficacies. IA was widely used for four decades before the first randomized clinical trials (RCTs) and EFM was used over a decade before the first RCT was available. Many of the RCTs designed for EFM compare it to IA, though it should be remembered that Benson et al. were highly critical of IA in 1968. Cochrane has published a meta-analysis comparing EFM to IA which showed no difference between the two in low Apgar scores, NICU admissions, perinatal deaths, or the development of Cerebral Palsy (CP). There was a 50% reduction in neonatal seizures, but a significant increase in operative vaginal delivery and cesarean delivery rates. Vintzeileos et al did show a reduction in perinatal death in the EFM group as compared to IA, on the order of one perinatal death prevention for every 1000 births, but with an associated increase in the cesarean delivery rate of 2-3 fold. Notwithstanding these controversies, EFM continues to be widely used today as a routine monitor of fetal wellbeing. Despite the widespread use of electronic fetal monitors, uniformity of terminology and standards were not firmly established until 1997 when the American College of Obstetricians and Gynecologists (ACOG) and the Association of Women’s Health, Obstetric, and Neonatal Nurses (AWHONN) along with other professional organizations adopted the terminology of the National Institute of Child Health and Human Development (NICHD) Research Planning Workshop for use in describing fetal heart rate patterns. The terminology used in this website reflects those standards and terminology. Finally, in 2008, a Three Tier system for interpretation was recommended to standardize management of “abnormal” tracings and hopefully lead to better research and better outcomes.